If we were having coffee today on this lovely Valentine’s Day, I would ask you to sit down for a few moments while I tell you the true story of how love conquered fear and loneliness and expanded our family. I dusted this post off out of the archives for just this very moment. Nothing says “love” more than a family who adopts a child, let alone two. When my brother married his wife 13 years ago, my sister-in-law already had two children of her own from her previous marriage. 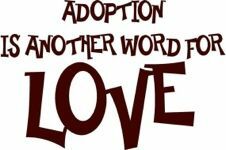 As both my niece and nephew grew up, and the house emptied, my bro and sis-n-law talked about adoption, since she was unable to bear more children. As they navigated the foster care system, they came upon two sisters who were in foster care and needed a permanent family. My bro and sis-n-law originally wanted a baby, but when they saw the girls featured on a television news story, they fell in love. 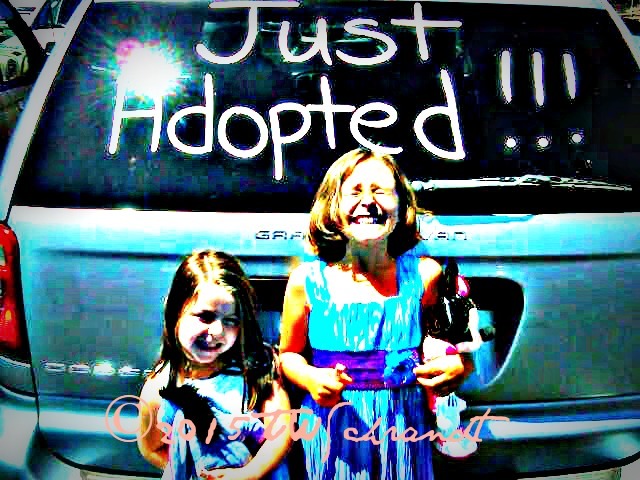 After the usual red-tape and legal hassles, the girls became permanent members of the family. Big deal, right? Another successful adoption. While adoption is the crux of this story, the real story is about the power of love under extraordinary circumstances. We already knew that my bro and sis-n-law were amazing parents. 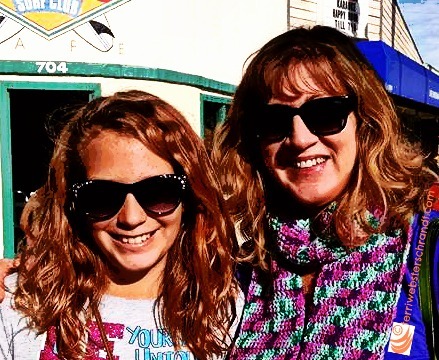 Sis-n-law’s daughter “KV” was diagnosed with bi-polar disorder at a young age and was medically treated, but not before she ended up in special education in school. After years of care and consistency, and dealing with KV’s bi-polar father and his shenanigans, KV was taken out of special education just before high school. That is a rarity. I saw first-hand what it took for my bro and sis-n-law to meet those challenges with love and amazing patience. When the little girls were first fostered with my bro and sis-n-law, they required counseling, medical treatment, and a boat-load of patience. The girls had lived incredibly horrible childhoods, the youngest one being too young to remember much. The oldest one recently underwent hip replacement surgery to correct the results of this early childhood neglect and abuse. The rest of our family looked on in awe as bro and sis-n-law dealt with the strain of parenting these little girls. I have loved watching my nieces grow up and enjoy normal, wonderful lives (camping trips to Yosemite, girl scouts, swimming lessons, summer camps). The oldest, AW, is now 12 years old, in middle school and LOVES to read. For someone not related by blood, she is kind of a mini-me (pictured). TW, at nine, is a girlie-girl, full of drama with a big imagination. They are deeply loved by all of us! Bro and sis-n-law are in the process of fostering another little girl. They hope to eventually adopt her as well. I have asked myself and others WHY would they want to keep going down this road? Do they not want peace? Bro is over 50 years old and never had children of his own. Bro is a wonderful uncle to my two daughters. Of course he wants children to call his own. And now he has them. The gift of extraordinary parenting falls on very few people. The gift of love also fell heavily on my bro and sis-n-law and I stand in awe of them daily. If they can keep bestowing love on children who need it, then who am I to question God’s will? I believe they find peace in knowing that they have literally saved lives, and for that, my heart overflows with love. Please join fellow bloggers in February’s “Love is in Da Blog, hosted by “Just Fooling Around with Bee.” Share your stories, poems, and photos about love. 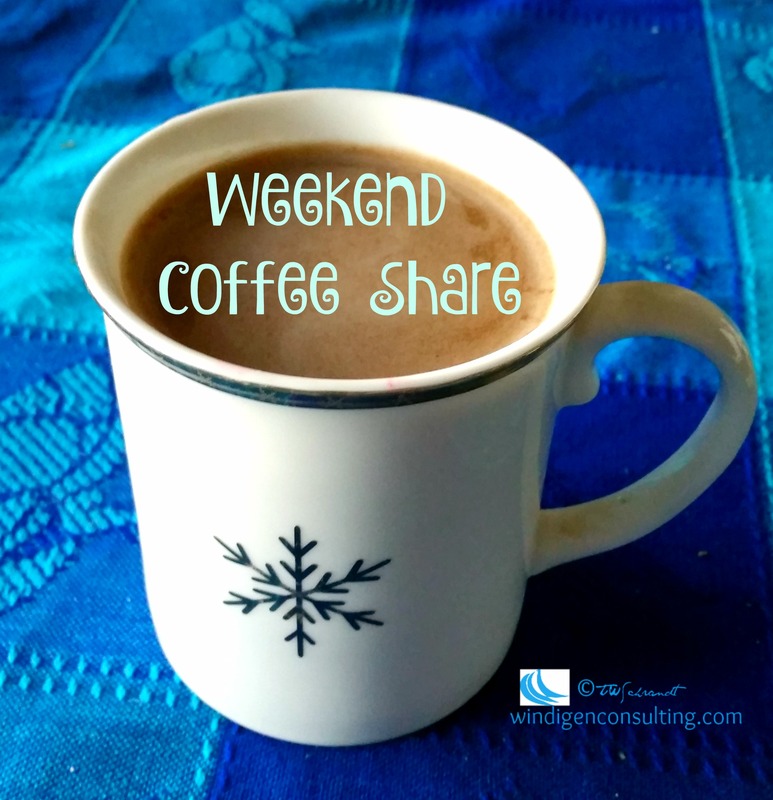 You can also join us for coffee and tea at Part-Time Monster’s Weekend Coffee Share! I just love reading stories like this! So uplifting to know there are people in the world wiling to open their homes and their hearts to those children who need it. I love this story. You have a beautiful family. This is such a wonderful story, Terri. When we look at our world today and see and hear on the news almost nothing but fighting, killing and misery, then it’s stories like yours that bring the sunshine into our lives. So right! For ALL involved. This is such a feel good story! And it couldn’t have come at a better time. Blessings to your wonderful family! Terri, Your brother and sister-in-law sound like amazing people. I can’t believe how anyone could abuse children, but thank God there are people like your wonderful family to try and make things right. Great read. Thank you so much, Laurie! I’m so glad people have read this post. It is such an important topic! How lovely. This is exactly what is needed for adoption of older children who have been hurt, I think – people who are realistic & prepared for what it will really entail, but who are committed and loving and able to see the light at the end of the tunnel. So glad the girls are happy and thriving, and your brother and sister in law have their children & are able to share their love and parenting skills with people who need it. Thank you! People get into fostering children for a variety of reasons, and adoption is an option. Not easy to take on two older girls who need TLC! Terri, I have learned that no matter how evil and chaotic we see the world, there are people like your Bro and Sis-In-Law who see the good. That no that they can’t ask who will do it, but when can I bring the child home to help them become better. Thank you, Antonio! They are amazing people and parents! What a beautiful story! I so admire what you are doing. The world needs more people like you. Aww, thanks Faye, I wish I could take the credit. This is my brother’s story, I just was privileged to write about it! Happy to be the girl’s auntie! Thank you, I love that! This is such a powerful story of the gift of love. Those are lucky kids to have such wonderful parents in your brother and sister-in-law. Thank you, Lori! I think they are all lucky! Beautiful story, and yes she is a mini-me!! Thank you so much for sharing this wonderful story, Terri. I know a couple who has adopted a brother and sister and given them so much love. The timing of your story was quite interesting. Last night, a young guy whose brother was tragically killed 3 months ago performed a song he’d written about him on a TV talent show. It was so moving but also reminded me of my health issues and my concerns about my kids. While I know that there are some really lousy birth parents out there and people who step in and perform miracles like your sister and her husband, I fight tooth and nail to be there for my kids thinking no one else can be their Mum. That’s me. This is actually quite a breakthrough for me because when I was really sick when they were smaller, I thought just about anyone could be a better Mum to them. It must be very hard to parent kids when you don’t know those family connections. I see so many different family members in my kids and it helps guide our path. My son is actual quite theatrical like me but doesn’t see that in himself. He wanders around the house singing and really seems to love but says he can’t sing. I am so pleased he’s now going in the Gang Show with scouts and hope he might find this part of himself. At hte same time, I know I miss the mark. I was really struck recently with ho0w the band teacher suggested my rather pixie like daughter takes up the Baritone horn when no more trumpets were available. I aksed all those negative questions like how she was going to lug it around on the train. I was pleased the band teacher had the vision to look beyond all of that. We are very involved with our local community and that I guess is my ultimate insurance policy if things don’t go so well. I’ll be relying on the village to chip in. What a wonderful story and what amazing people your brother & sister in law are! I love the photo of you and your niece. They have tremendous hearts. So special thanks for sharing this. Thank you, and I hope you had a wonderful Valentine’s Day! Love indeed. My best friend fostered and later adopted two children. She is the most amazing person I know. Hi, Terri! Thanks so much for stopping by my blog and liking my post on Van Gogh’s Bedroom. I am so happy that you did today because when I bopped over to yours I ran into this beautiful post on your bro and sister in law and their wonderful family. Thanks for sharing this, a beautiful Valentine’s Day story. A very different type of love than we usually talk about on Valentine’s Day, but no less valid. Great story. And hip replacement at that age? Wow, that must have been some very nasty abuse and/or neglect! Its great that she is in a loving household and is able to flower! Thank you, Trent! She was locked in a tiny room for hours on end, where she could not stand up all the way, while her mother did drugs. I am just amazed the girls have both come so far! Thank you, Judy. They are crazy busy but that is how they like their life! Hi Bee, thank you for hosting! You are very welcome. It is a pleasure! Thank you, Diana, very true. Two other girls have been placed with my brother eventually went with their own family members, however broken those were. My new nieces are really lucky. I imagine it’s difficult to watch them go back to families that might end up hurting them again in some way. Wish there were better solutions to all of the ways we deal with adoption and fostering, but I suppose we do the best we can, for the most part. What a powerful story and testament to your brother and sister-in-law. I love a story where LOVE wins! Happy Valentine’s Day. Isn’t it cool? Thanks, Michele. Hope you are having a wonderful Valentine’s Day! A wonderful story. Cheers to you BIL and sister to change the life of the girls. Such a heartwarming story! I love to hear about stories like these. The children your brother and sister-in-law adopt/adopted are very lucky children! Happy Valentine’s Day! Thank you PJ, I really believe the girls would have been homeless or worse by now if it weren’t for them. Happy Valentine’s Day! That would have been so sad. I’m glad your brother and sis in law saved them! Amazing story, Terri. Such a heartwarming post.. I am so glad it turned out so well for them, and that they feel loved 🙂 Happy Valentine’s Day! Thank you Denice, I’m proud of them all! Happy Valentine’s day to you and yours!